While many of the Facebook Apps demands permission to send you email to use them but if you are keen to avoid sharing your email address with the developer and yet use their Facebook app then "how to hide your Email Address in Facebook from Third Party apps" there is a simple option in itself but probably not displayed prominently. And many users even skip the apps like Farmville as it just fill the inbox of your account with advertisements and later which might also be leaked to other advertisers along with it. and people love to play games on it. Unfortunately, some of these applications need to know your actual email to play games that mostly people don’t want others to know it. 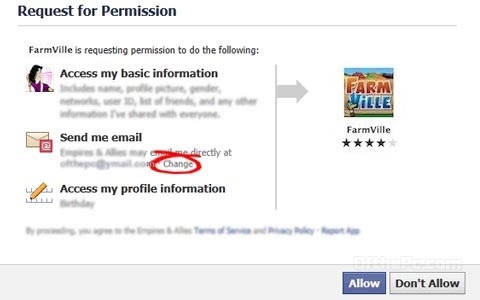 So however if you are a interested in playing games like Farmville or Cityville or any of the other popular games on Facebook then don’t worry that you’ll be required to share your email address with the game developer. Here is a simple step to avoid such interruption in your privacy simultaneously, go ahead with the Apps like such. How to hide your Email Address in Facebook from Third Party apps? After singing in for the game & once Request for Permission is asked- "allow me" to share the Email Address, halt, just click Change under “Send me email”, Facebook will offer you a new and anonymous email address that you can share with the app developer. Any messages sent to this address will still reach your main inbox but your actual email address will stay hidden from the app developer. Also, once you decide to remove the game /app from your Facebook profile, that proxy email address will be gone too.